The trumpeter, brother of guitarists Kevin and trombonist Robin, leads a sharp band of top players, and the result is a gem. When you lead a recording date that features pianist Marc Cary, tenor saxophonist Abraham Burton, Eric McPherson on drums and young bass phenom Dezron Douglas, you are a top player. Throw in Steve Nelson on vibes? Wow. Duane Eubanks is the most understated of trumpet heroes. Things of a Particular Nature is just his third date as a leader, and the first in almost 15 years. The result is a recording that combines supreme relaxation and the bite of urgency in a hip blend. The quick “Dance with Aleta” embodies Things beautifully — it is funky and hip-swaying, putting across a sassy blues melody in trumpet/tenor unison, and each solo seems like a thesis statement of cool — but never lazy — improvisation. It’s concise too, the length of a pop song. Like those great Blue Note albums of the 1960s (and, let’s be honest now, maybe of the 1980s too — time to give that era its due), the playing never strains to be cool or daring. It plain is cool, but it's smart enough to be offhand about it. Eubanks may be the younger brother of Kevin (Tonight Show) and Robin (trombone magician), and he may have delayed his music career to study accounting, but the musicianship here is independently sterling. 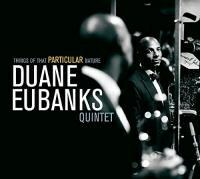 Listening back to recordings Eubanks has made with Dave Holland, for example, the crackling artistry is clear. The mood on Things is mostly mellow, but it is also fleet and precise. “Slew Footed” has a tricky theme, and the leader states it alone with accompaniment by this solid but also daring rhythm section. Eubanks keeps it relaxed, but you hear him control the tempo and groove with every note. When Burton enters for his solo, there is even more push-and-prod to the tempo, as McPherson accelerates and downshifts like a master conversationalist. But, ultimately, Eubanks sets the theme. The center of the recording is a set of tunes that move at mid-tempo and are hard to get out of your head. “As Is” sits so squarely in the pocket that its opening with a Marc Cary piano solo doesn’t seem odd. When Eubanks’ melody enters, it is as if you already know it. “Rosey” is an irresistible stop-start theme for Fender Rhodes piano and horns in harmony that suggests why Cary should probably be discussed in the same conversation with Robert Glasper. He takes the only solo here, and it manages to suggest “classic Blue Note jazz” and modern hip-hop at the same time. “Beer and Water” is even more appealing, a theme that shifts between Latin, modern swing, and stop-time without effort. Eubanks’ opening solo crackles. The album closer, “P”, is another tune that wraps up your ears in pleasure. There is also music on Things that leans toward more complex structures, but even these tunes are rich in easy appeal. “Purple, Blue, and Red” begins as a ballad for Cary and Eubanks, but the tempo kicks in and Burton harmonizes the searching theme with off-kilter harmony. The solos jab and investigate the song structure, a bobbing, bouncing essay on post-bebop joy. “Anywhere’s Paradise” is a ballad built around slow Latin/tango feeling, a wave of impressionistic chords that float and shimmy in minor-key mystery until Eubanks sketches a gentle melody. On two tracks, the quintet is expertly supplemented by Steve Nelson’s vibes. Nelson was a frequent collaborator with Eubanks in the late Mulgrew Miller’s “Wingspan” band, and “Holding Hands” is a winning waltz theme from Miller’s book. “Aborted Dreams” is more brooding, with wonderful work by McPherson on cymbals, sculpting atmosphere for the whole band. After enjoying Things of a Particular Nature many times over, I realized that I was comparing it to some of my favorite records by trumpeter Woody Shaw. Like Eubanks, Shaw made a case for himself as a major trumpet voice a bit later than most players. Rosewood and Stepping Stones still sound great and, like this record, they made challenging music into a seductive experience for the listener. Maybe this is what real maturity in art is about: a blend of grace and daring that is not forced in the slightest. That, indeed, is Duane Eubanks.